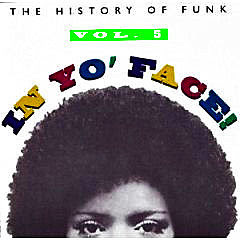 The fifth and final volume of the "In Yo' Face" series continues to showcase the best work from some of the most popular and well know funk acts of all time. Highlights include the Beastie Boys sampled "Loose Booty", a stomping Rick James track, the one and only "Flash Light" as well as popular cuts from Ohio Players, The Bar-Kays and Con Funk Shun. While taking a populist viewpoint ( you wont find any rarities here ) it does succeed in terms of being a party friendly funk compilation with wide appeal.